Dorothy’s daughter said that the family feel less worried and stressed now, knowing that Dorothy is in a safe environment and that help is at hand if she needs it. Prior to Dorothy’s first stroke in 2012, she enjoyed dancing, walking her dogs, going on holiday & the independence created through driving her car. Living in her one bedroom bungalow provided by social landlord, she struggled through with having to manage everything herself – from shopping to paying her bills. 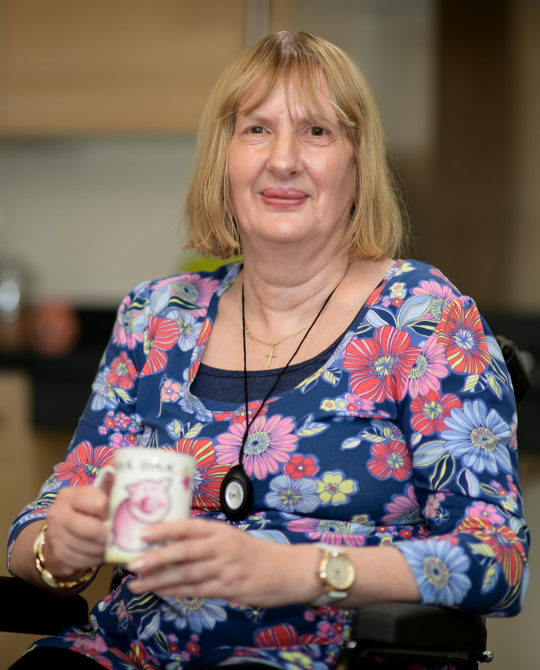 Following her first stroke, she became very isolated and lost the majority of her independence, as she was no longer able to do the things she enjoyed without support of carers, friends or family. Dorothy began to feel a burden to others and suffered a further three strokes, with the last one occurring in early 2017. Dorothy received a care package but her isolation and unhappiness continued as she felt there was no continuity of care, with different careers attending to her needs, with no social element of support being provided. “I felt that for some time I had no quality of life and I was just surviving” Dorothy said. Dorothy’s feelings of isolation and burdensome existence have disappeared. Living at The Dunes has allowed her to make many new friends who not only who’s company she enjoys, but who she share’s common interests with. Charis Gracie, Supported Living Co-ordinator at The Dunes explained that “Dorothy gets involved in the daily activities as much as possible and seems to really be enjoying organising lunch and coffee dates with the other tenants to get to know them better”. The difference Dorothy feels in herself is centred around the companionship and safety living at The Dunes is providing for her. Dorothy has a new lease of life. Growing old was an inevitable and worrying part of daily life – however, within supported housing, she is cared for by regular carers and has built relationships with them, meaning care is quickly evolving into friendship, and in turn, addressing the social issues she felt before. In practical terms, Dorothy loves ‘her flat’ and patio area, as she can sit out when the weather is nice and relive those dog walks and holidays from her past! Douglas I love my new flat. It’s so quiet here. Douglas lives independently because of supported housing. Steve "Supported Housing is so important, it has saved my life."